Creative rendition of the Maison du Chocolat recipe for Chocolate-Apricot Tart with handmade chocolate decor. Chocoholics, be forewarned! This tart is addictive. The recipe comes from La Maison du Chocolate, my all-time favorite chocolatier in Paris, which means it is my favorite shop in the entire world! La Maison du Chocolate (House of Chocolate) was created by Robert Linxe, the renowned Parisian chocolatier who is legendary for his perfection of the chocolate-making craft, especially his exquisite chocolate truffles. 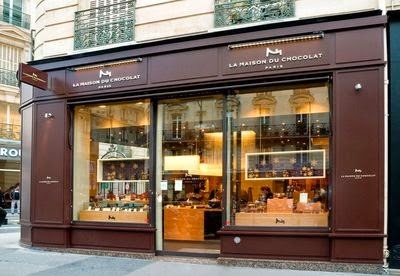 The tantalizingly chic boutiques of La Maison du Chocolat (in Paris, New York, Tokyo, Seoul and other chocolate-savvy cities around the globe) offer exquisite artisan chocolates and desserts, handcrafted using the finest-quality ingredients. More delightful treats inside the La Maison du Chocolat boutique! What better inspiration could you find than fine chocolate made with Parisian finesse? 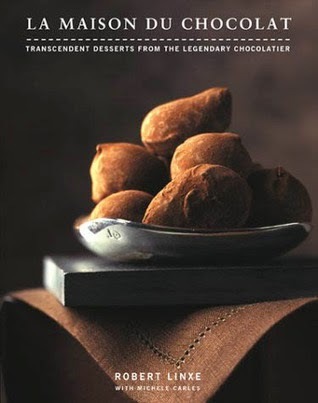 The Chocolate-Apricot Tart recipe comes from Robert Linxe's La Maison du Chocolat cookbook. Indulgent and elegant, it's the type of dessert that fashionable French women enjoy regularly despite being impossibly slim. The cookbook French Women Don't Get Fat by Mireille Guiliano includes a recipe for Tarte au Chocolat. The secret: decadent desserts counteract cravings and binges, by satisfying in just a few bites. This chocolate tart is rich and creamy and appeals to a sophisticated audience. Although this recipe is easy to make, the preparation is time intensive because it requires a few separate steps. Begin by "blind baking," a method of baking the pastry crust by itself first. After the crust is baked, you will spread a layer of apricot jam and then pour the chocolate ganache filling onto the baked pastry shell(s). 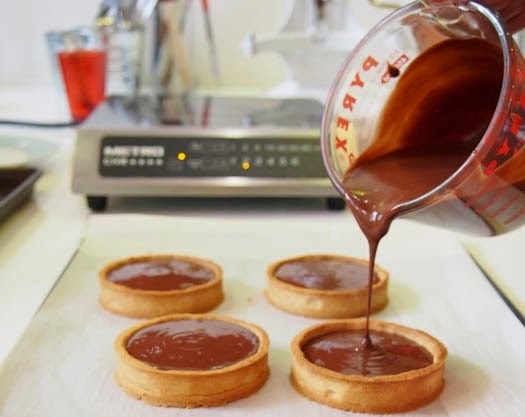 A key to success is allowing the ganache to cool to the proper temperature before filling the tart, so that it does not mix with the layer of apricot filling. The result should look perfectly smooth. 1.) Prepare the pastry crust: In a bowl, combine the butter and sugar. Use your fingers to rub the mixture together until it resembles cornmeal. Add the egg and egg yolk and combine into dough. Mix in the flour quickly but do not overwork the dough. Form the dough into a ball and refrigerate for at least 2 hours. The perfect ball of dough, ready to refrigerate! 2.) Grease the tart pan. Roll out the dough to 1/4-inch thickness and cut it into a circle slightly larger than the tart pan or ring that you are using. It is also possible to make several smaller tartlets. Place the tart dough over the tart pan or ring. Prick the base of the dough with a fork in multiple places. Then refrigerate for at least 3 hours, which prevents the pastry from shrinking during baking. 3.) Preheat the oven to 350 degrees Fahrenheit. Line the pastry with parchment paper and fill with ceramic pie weights to "blind bake" the pastry dough. Bake for 10 minutes, then remove the pie weights and continue to bake until the pastry is golden brown. Use ceramic beads (sold at kitchenware stores) to "blind bake" the pastry shell(s). 4.) Allow pastry shell(s) to cool while following steps 5 and 6. Perfectly baked pastry shells will be golden brown. 5.) To prepare the apricot filling: Combine apricot jam, two teaspoons full of water and 1/4 cup sugar in a saucepan, simmer over low heat for 5 minutes while stirring occasionally. (If the jam is chunky, use you spoon to mash it up.) Remove from the heat and allow to cool down. Pour the apricot filling into the pastry shell(s). For a touch of local flavor, I used Frog Hollow Farm Organic Apricot Conserve made in Brentwood, California. 6.) 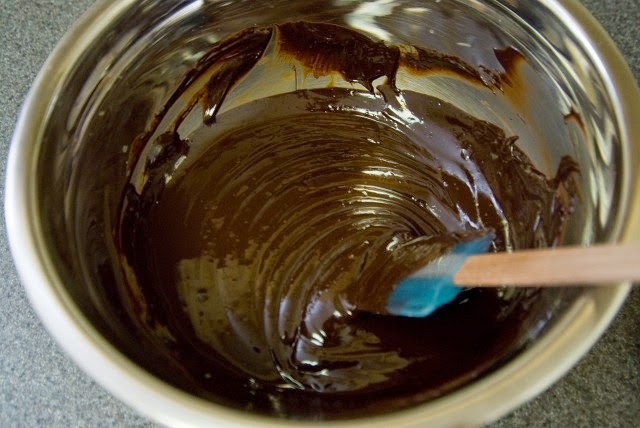 To create the chocolate ganache filling: Chop up the chocolates into small pieces and place in a heatproof (metal, glass or ceramic) mixing bowl. Heat up the cream and vanilla in a saucepan and bring to a boil for 20 seconds. Remove from heat and pour cream through a strainer (discard the vanilla bean). Allow to cool down for 30 seconds and then combine the chocolate with a whisk, until the chocolate is melted and the mixture is smooth. 7.) When the chocolate mixture is lukewarm (but not hot), pour it over the apricot filling. 8.) Allow the ganache to cool and harden; serve the tart(s) at room temperature.